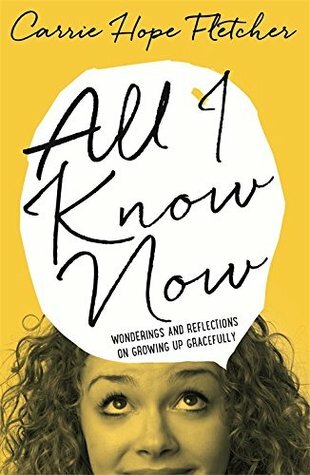 Book Review: All I Know Now - Carrie Hope Fletcher | What Does Mel Think? I have watched Carrie on YouTube for as long as I can remember, and would call myself a very proud 'Hopeful'. Even to the point of having an 'ItsWayPastMyBedtime' t-shirt! So obviously when 'All I Know Now' came out I had to read it. Carrie coins this book as 'the essential guide to surviving 'The Teen-Age' and Andrew Kaufman author of 'All My Friends are Superheroes' described it as 'a best friend in book form'. In short, this book is a 'how-to' manual covering many struggles facing teenagers growing up from more trivial issues such as the Internet to serious problems such as bullying and mental health. Carrie adds lots of anecdotes from her own experiences in order to reassure the reader that they are not alone! I think this is such a good idea because Carrie is someone who many teenagers look up to, so to learn that she was bullied and had issues with friends too is very comforting! THIS IS SO TRUE! This one tiny section of the whole book has stayed with me and I have noticed a difference in my outlook over the last week since I finished the book! Sometimes I get myself so wound up about going to work or school or travelling, but by worrying about it I just make myself feel ill or have a panic attack. If I had not worried in the first place, then the situation would have been totally fine. It boils down to the age-old saying of 'What if...? ', what is the point of wondering what may happen if it is fated to happen anyway? You are going to be much more able to deal with the situation if you are calm than if you are on edge because you 'know' something must be about to happen. You can see that this book has advice that could help people of all ages! As I first began reading it, the friendship and bullying section seems more aimed at a younger audience but as it developed into love and generally how to be a good person it could be appreciated by someone of any age, I honestly think I would have LOVED this book if I were 13 years old going up to high school, as a 17 almost 18 year old it is good to read in hindsight and interesting to hear about Carrie's life, I enjoyed reading it, but at points I did feel a bit too old. Have you read 'All I Know Now'? If so leave me a comment about what you thought of it, or if you're intrigued and want to read it.